Home » EISENHOWER, DWIGHT D.
34th President of the United States; Supreme Commander of allied forces in Europe during World War II. Eisenhower, Dwight (1890 – 1969). Thirty-fourth President of the United States. Typed Letter Signed. On White House stationary. Dated at Gettysburg, August 13, 1959. 6 ¾’ X 9”. To longtime New Hampshire Congressman and Senator Norris Cotton; “Dear Norris: “For the Administration as a whole, as well as for myself, I want to say that your vote on the housing veto was gratifying indeed. It was particularly pleasing to me to note the cohesion on this issue among Republicans in the Senate. 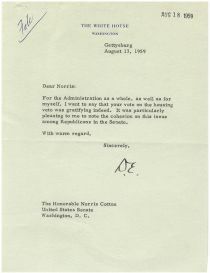 With warm regard…Sincerely, D.E.” The Senate had just voted to support the President’s veto on the Housing Act of 1959 and Ike here sends his gratitude for Cotton’s support. Center fold, Excellent condition. TLS 1 page 6 ¾” x 9”. On imprinted White House Letterhead. 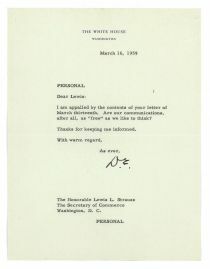 To Secretary of Commerce Lewis L. Strauss. Dear Lewis: I am appalled by the contents of your letter of March thirteenth. Are our communications after all, as “free” as we like to think?” Initialed at he conclusion of the letter. “D.E.” An interesting letter raising question concerning privacy issued within the government during the 1950’s. One center fold. Excellent.